Characteristic 1. The RF Card Lock/ hotel lock/electronic lock own Latest Design from famous Germany craftsman. 2. The RF Card Lock/ hotel lock/electronic lock is Elegant and noble appearance. 3. The lock is the latest design patent item with elegance and luxury. 4. Super exquisite craftsmanship, never rusted or faded. 5.This product allocate with the European standard pure stainless steel mortise. 6. Door thickness request is not less than 3.5cm. 7. Choices for RF Card: America TEMIC / Philip MIFARE. 8. Free rotating handle, prolongs mechanism life the furthest and also avoids unlocking by violence. 9. 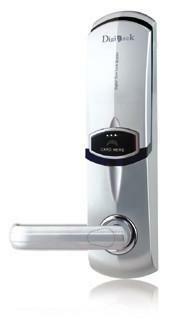 U-design handle is the first choice, protect body the furthest. 10. No longer install the electrical machinery inside the mortise, which facilitates the maintenance work. 11. The installment is extremely convenient. The three parts-the front lock body, the mortise and the back lock body are very simple and clear. 12. The RF Card Lock/ hotel lock/electronic lock is very easy to change batteries in the lock, just need several minutes on one lock.